One of the first lessons a fledgling equine photographer learns is to avoid using lenses that distort the horse’s image. You never want the horse’s beauty to be compromised through unflattering angles or a lens that emphasizes the wrong aspects of his conformation. You learn to stand in certain places, shoot at certain heights and only deviate from the norm to camouflage conformational faults or emphasize what’s truly exceptional. I followed that mantra religiously for decades, rarely, if ever, straying from the written (and unwritten) rules that mandate all aspects of equine photography, including photographing over fences classes with at least a 150mm focal length (preferably 300 to 400mm). Over the past few years, though, I’ve experimented with wide-angle lenses and horses, and it’s been really fun! 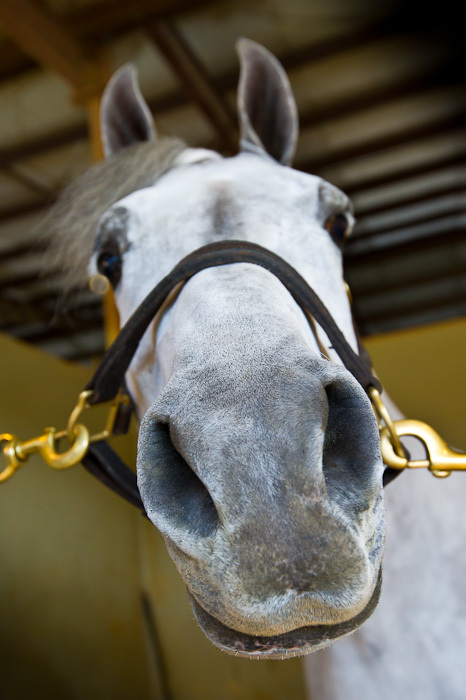 This week’s WordPress Weekly Photo Challenge is the word “Distorted.” Even though Showffeur’s nose isn’t really his best feature, it certainly makes for an entertaining, although not quite proper, equine image. I can almost hear him and see him move! Yes, he was almost touching the lens! Thank you! I enjoyed your sculpture, too! Love your shot! Cool perspective. This is fun! And rules are just rules..they can be bent, twisted, or neglected altogether at times…you never know what may be the outcome!!! Thank you, David! I do enjoy playing with the wide-angle lens! Thank you! Yes, he was at a show so had just been freshly trimmed. He’s quite a ham and loves the camera, too! I just read your weekly photo challenge about Regret and totally understand. Horses are imposing beings, and sometimes you do feel small and fragile around them. Once you do get to know them, though, most are friendly toward people. Horses are creatures of flight, though, and their first reaction when scared is often to flee. It sounds like you experienced that on your first ride, which is unfortunate. I hope you do one day ride again and have a better experience. In the meantime, feeding your new friend apples and carrots is a great way to establish a lasting friendship. Thank you! Yes, the nose knows!